Intecreus is maintained to build an organization which will geared up to meet the challenges faced by our clients and support them in being compliant with their SLAs on service and deliveries. So that they can be as a member of Intecreus at one managed Solution Center. Our Mission to Serve our Customer for Technology to Reach. 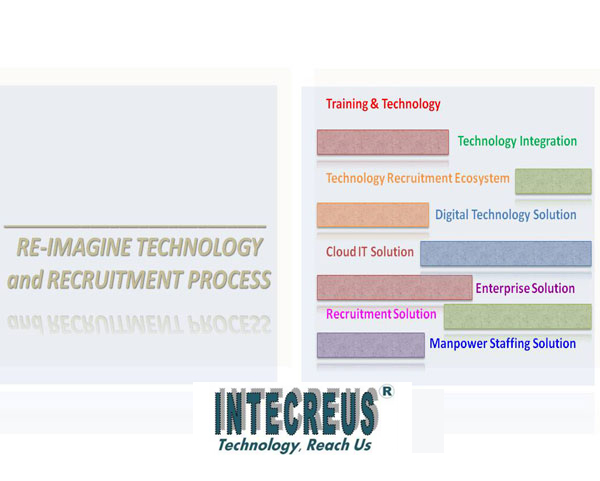 Intecreus has a mission to enabling IT services for our clients to meet their challenges by offering and strengthen our processes to ensure personal and professional growth of our most valuable asset. Make IT Solution and IT Services available to Customer at low cost and with high quality with effective database management. Our Focus - What we do and want to do. We make sure that our clients remain with us as a member of Intecreus team with the company for growth the mutual corporate relationship. We are focusing towards recruitment, staffing, IT Solution and business process outsourcing service with recruitment process outsourcing in consulting services for our top IT clients in information technology industry. Our Approach to reach Technology for our Customer. Intecreus believes in high-touch account management centered on your needs at all times, during change, during growth. Which helps to boost the relationship of the management . Hence improving customer experience, Customer Service, providing with new updated technology with data privacy and managing global workforce in technology management group with Customer Database Management System. About “Mr. Vivek Goyal”, Born in December 24, 1987 in Punjab (India) and has native family background from Punjab (India). Vivek has completed his education in i.e Graduation B.B.A (Bachelors of business Administration) from D.A.V College, Chandigarh (Punjab University) and M.B.A Hon.– (Master of business Administration – Honour’s) from Lovely professional University (L.P.U), Punjab (India) in Concentration “International Business - IB” and “Human Resource Management – HRM” with Global onsite Internship in “International Business Program” at UNCC (University of North Carolina at Charlotte) in Charlotte, North Carolina (USA) and MDIS, Singapore. Vivek has expert knowledge of “Financial Market” and has attained various level of NCFM during his academics. Vivek has excellent expereince in corporate industry towards Staffing and Recruitment, IT and BPO. He has worked in different industry verticals covering - Banking and Finance, Capital Market, Insurance & Healthcare, Manufacturing, BPO etc. He has provided his service (worked) in various companies like “Karvy Stock Broking Limited” , “Malwa Industries” , “Genpact Headstrong Capital Market” and various other IT Development companies. Vivek has attained “Certificate of Merit for Outstanding Contribution at CMITS for Onsite Global Recruitment” while working in Genpact Headstrong. He has excellent knowledge and expereince dealing with International clients and attending global seminars for generating new business. Vivek has great knowledge of corporate geography which has helped him to provide services to global client’s for his company Intecreus in worldwide market. For more Details, Please follow us on: Facebook, LinkedIn, Instagram, Slideshare. Certified Company of "Quality Management System". This indicates that our company has focus towards providing world class technology services in Manpower supply, Staffing and Recruiting provider by standardized IT Framework to our clients. Registered certified Company. The company as gained high level of confidence in providing IT Services which meet standard of quality and safety. The company is enable to meet the highest level of assessment and professionalism in the industry. MSME govt. of India Certified. Our Company is registered under Udyog Aadhar MSME. Intecreus is maintained to build an organization which will geared up to meet the challenges faced by our clients and support them in being compliant with their SLAs on service and deliveries.